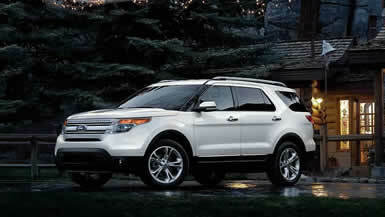 The 2011 Ford Explorer Review: The Ford Explorer arrived with the 1990s and became America’s favorite family transporter. Based on the popular Ford F150 pickup truck, it was rugged and roomy and wore sleek and attractive styling. A huge hit, and it defined the segment. Today, car-based crossovers are the thing. The balance is shifting away from SUVs and towards the unibody designs of the more pleasant-to-drive crossovers. So, this new 2011 Explorer is joining them. It’s an all-new design, with some of the look of the radically redone Taurus. A bold grille up front flows into stretched-back headlamp pods that rake way back into the body. The windshield angle is more carlike, but the wheelwells are still prominent. The rear glass leans forward, instilling a sense of urgency. The taillamp assemblies mimic the shape of the rear windows in an attractive symmetry. Inside, the surfaces feel more upscale, and they are carefully designed to feel substantial, too. You still sit tall in the saddle. In my Golden Bronze Metallic test car, the interior was covered in warm “Pecan” perforated leather because it was the Limited model, the top of three, which include base and XLT. New is the MyFord Touch™ driver connect technology, combined with Ford’s popular SYNC® integrated communications and entertainment system. You use a large central touch screen and a split instrument panel that you control with two sets of buttons on the steering wheel spokes. The left side of the instrument panel shows display mode, two trip odometers, fuel economy information or various settings. On the right side, you can select the entertainment options, navigation, phone and the climate control. The main 8-inch screen provides a home page, like a computer’s home page. It provides access to a wealth of information, such as the heating and cooling seat settings, ambient lighting settings, and even weather and traffic information. Interestingly, you can load photos into it and display them as wallpaper, also like your personal computer. You can configure the information to suit you. For example, I had the fuel economy on the left of the dash, accumulated and current, the settings for the SiriusXM Radio on the right side, and on the center screen, navigation information, all viewable and settable at the same time. The system also responds to voice commands for many of these functions, which keeps your attention on the road and your hands on the wheel. My tester had the standard 3.5-liter V6 engine, which puts out 290 horsepower and 255 lb.-ft. of torque to move the 4,695-pound car. A six-speed automatic is standard; in the XLT and Limited it allows manual gear selection. You can tow up to 5000 pounds. There is also an optional 2.0-liter EcoBoost™ I-4 engine offered, but it is designed for those only concerned about fuel economy. It’s hard to imagine it being effective at moving a two-ton SUV, but I’ll have to test one to be sure. The EPA rates the new Explorer at 17 City, 25 Highway with two-wheel drive and 17/23 with four-wheel drive. These numbers are up to 20 percent better than last year’s V6, according to Ford. I averaged 16.6 mpg over a week, not quite as good as the EPA, but I spent a lot more time in town than usual. The EPA’s Green Vehicle Guide rates the Explorer at 6 for Air Pollution and 3 for Greenhouse Gas. The four-wheel-drive system does away with the old 2 High, 4 High, 4 Low settings and now gives you a dial to select by road condition. Pick from Snow, Sand, Mud or “Normal.” There’s also a Hill Descent control to modulate your driving downhill. The Explorer is a big car, with three rows of seats and lots of room for people. My upscale, top-of-the-line model had electrically folding third row seats. This makes it easy to configure the cargo space. These were part of the “Rapid Spec 302A” package that included several other electronic marvels, including the amazing active parking assist, which locates appropriate parking spaces and then steers your car into them. Rain sensing wipers are also part of the package. My car also featured blind spot warning, adaptive cruise control and collision warning systems. The base model offers much of the features that make the Explorer worth owning, but the XLT will surely be the volume model. Pricing starts at $28,995 and works up into the 40’s. My tester, with options, came to $45,415. The new Explorer seems to do everything well. It was a real pleasure to drive, and everything I touched felt good. The 3.5-liter engine hums. No buzzes or rattles. Everywhere the eye alights is something nice. If you’ve got a houseful, you owe it to yourself to take a look.